Hey Dimwit, come ride the easyCLIMB Trail at Cascade Locks with us. Well, you may not be a Dimwit yet, but if you join us for a winter Friday night ride in the 30 degree, 40 mph wind, you instantly qualify. The year round trail that flows through various topography and vegetation typical in the Columbia Gorge. From Oak and grass savannah to open forest, the trail provides stunning views of the river and Gorge walls. Less than 200 ft of climbing is necessary along the trail and can generally be classified as a green route, yet don’t expect a flat and straight path. The route should take from 20 minutes to 50 minutes depending on speed and ability. 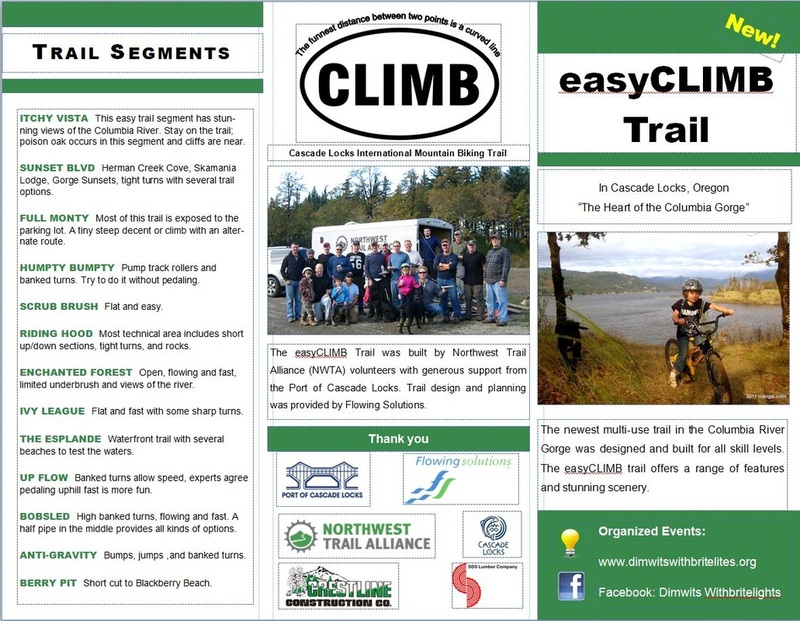 easyClimb was constructed by Northwest Trail Alliance, in partnership with the Port of Cascade Locks and community support, to provide an introductory mtn biking experience for all. The trail is designed for biking however is open to all non-motorized users. Expect obstacles, features and other elements designed to trail new riders how to handle their bike and body position. Alternate routes are typically provided.